YouTube is starting to put notices below news clips that state if the video was produced using public or government funds. Labels were first applied to US uploads in February and now will appear below videos seen in the UK and Ireland. The video-sharing site said the labels would provide "greater transparency" about sources. The notices will mainly appear on videos produced and shared by public broadcasters. Videos produced and shared by the BBC are expected to get the labels. 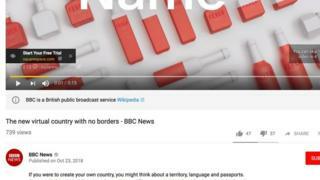 A BBC spokesperson said: "As a public service broadcaster, we welcome transparency on online platforms to help people identify trusted news sources such as the BBC." The BBC understands that videos uploaded to YouTube by Channel 4 would not get the label. A link to Wikipedia will also be provided so people can find out more about each broadcaster. YouTube said it did not expect its labelling to be "perfect" and would welcome feedback about videos it tagged as publicly funded. It said it began the initiative to help ensure that "authoritative sources" for news gained proper attention.